The following group types are not accepted by this hostel: Holiday with Friends, Junior / Primary School, High / Secondary School, Stag/Hen/Bachelor Party, Sports Group, Cultural Group If you have misrepresented the type of group you are booking for, your booking may be cancelled by the hostel." Intimate I Comfort I Cosy I Passionate - Tucked away in the most vibrant corner of Singapore's exciting heritage neighbourhood of Chinatown / Ann Siang Hill, steps away from the central business district! We strive to deliver beyond the promise of clean rooms and a safe environment, because we know what being a young entrepreneur on a budget is like. Book yourself a capsule bed to crash for a few nights! Tribe Theory is an entrepreneur centric hostel housed in the heritage shophouse of the oldest Chinese clan in Singapore. Every brick and tile of this building, and of this neighbourhood, is seeped in the history and DNA of the entrepreneurial spirit. Our map will show you where conglomerates next door in the Central Business District began as startups in the heart of Singapore and grew into blue chip companies. Located a short 3-5 minutes walk from 2 different MRT Stations (Chinatown and Tanjong Pagar) on 3 different lines, getting around the city will be a breeze. Singapore’s busiest and most famous hawker and food centres - Maxwell Food Centre, Amoy Street Food Centre and Chinatown Food Street are at our doorstep. Enjoy value for money and mouth-watering hawker food right at our doorstep, a quintessential Singaporean experience. We have a beautiful workspace in our loft where you can spend the day working peacefully on your venture. 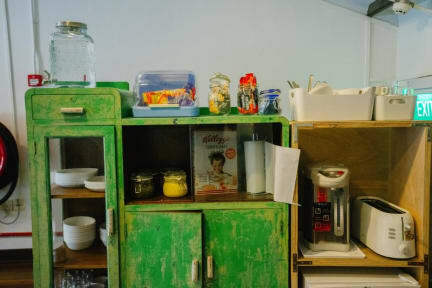 We have a communal kitchen and we also offer a simple free breakfast every morning which includes a free flow of coffee, tea, milk and juice. All rooms are mixed dorms with capsule beds and come equipped with air-conditioning and personal lockers. There are no ensuite rooms; toilets and shower facilities are communal. Muy conveniente en todos sentidos. Excelente servicio por parte del personal. Los lockers no necesitan candado. Está ubicado en una zona de bares, pero el ruido no no escucha en las habitaciones. Lo único negativo que encontré es el tamaño del dormitorio; muy muy pequeño.